This flavorful vegan take on “Huevos Rancheros” replaces scrambled eggs with spicy scrambled tofu. Jeff Johnson created this recipe and demonstrated how to prepare it at the Simple Mexican Vegan Food cooking class on June 19th, 2014. This dish would be the perfect thing to bring to our Fiesta-themed Potluck and Bonfire happening this Friday, June, 27th. To make the scrambled tofu, heat a thin layer of oil in a large pan over medium-high heat. Mix the two varieties of tofu in a medium bowl. Add the cumin, turmeric, and nutritional yeast, and mix until blended. Put the diced onion, minced garlic, and anaheim peppers in the pan and cook until the onion has softened, about 5 minutes. Add the tofu mixture to the pan and combine with the vegetables. Decrease the heat to medium and cook, without stirring, until the tofu begins to brown, about 10 minutes. In small batches, flip the tofu and cook until the other side begins to brown, about 5 minutes. Sprinkle the tamari over the tofu and remove from the heat. Set the scrambled tofu aside. To make the ranchero sauce, put the tomatoes, quartered onion, garlic cloves, serrano peppers, and ancho chile powder in a food processor and process until smooth. Heat a medium skillet over medium-high heat. Coat the heated skillet with a thin layer of canola oil. Pour the tomato mixture into the skillet. Cook until heated through, about 5 minutes. Season with salt to taste. Line a plate with 4 corn tortillas. 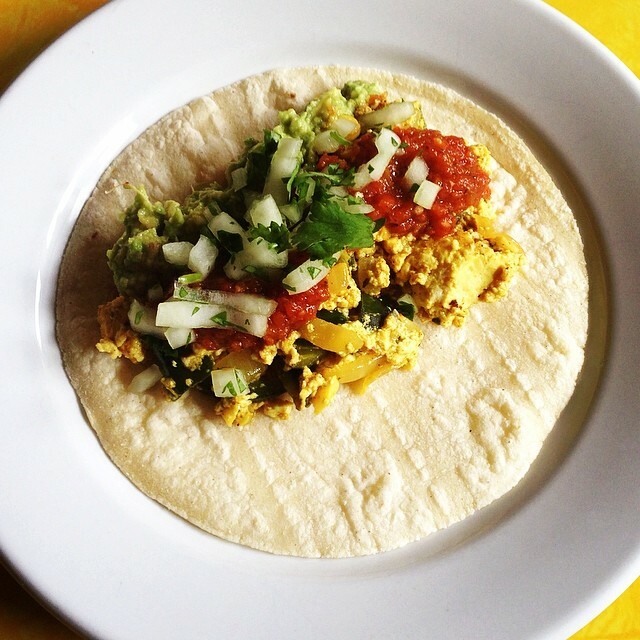 Spread 1/5 of the scrambled tofu over the tortillas. Drizzle 1/5 of ranchero sauce over the tofu. Repeat this process with 4 more plates. Garnish with cilantro and onions and serve. Find the original recipe on Jeff Johnson’s blog.